Low Carb Week, day 1, Monday the 8th of December. This was a great way to start the day, and often how I start it. Almost always have omelet but different variations. 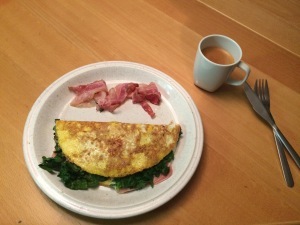 So what I had was a 2 egg omelet, with some melted chess and ham inside, plus fresh spinach (I never bought spinach before I started low carb), oh and 3 pieces of bacon. Yes, you ready that correct, a diet that includes bacon. Funny enough for a Dane, I never bought bacon before! So low carb, low calories and full YAMMY. In the past I often had cereal or if I was late for work, I would just buy some bread or yogurt. I often have some meat or chicken, or just salad with tuna. Side-dish is often broccoli, spinach or salad. Not as in the past, pasta and pasta and some more pasta, interrupted by pizza. 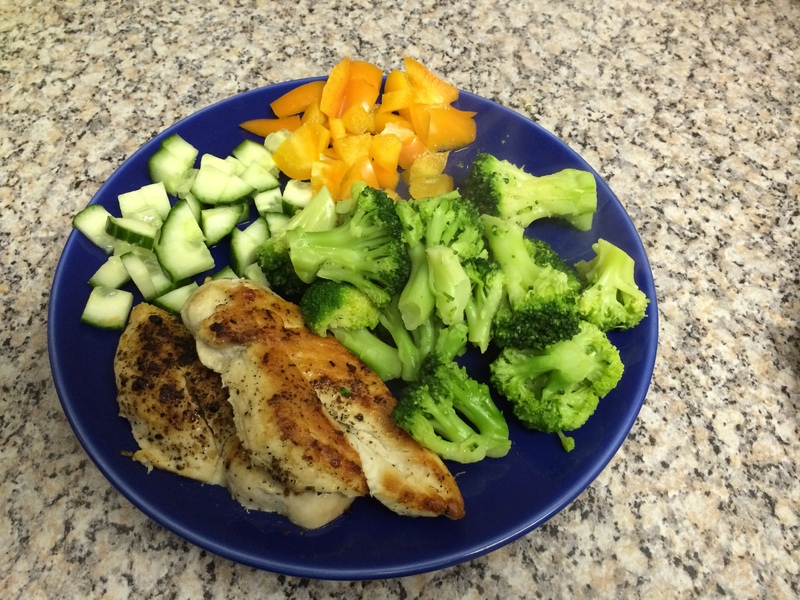 Chicken, lots of broccoli, sweet pepper (Bell pepper) and with some cucumber. Nice big portion but at the same time very low on calories and carb. Yes, never forget to track the snacks. Oh, I did forget to add the 3 small homemade cookies from my daughter, but since today was low in calories and carb I decided to go with another snack. Not going to explain what it is but I sure like it. It does have 210 calories and 28.7 grams of carbs but it was worth it. Total of 49 grabs of carb, this qualifies for low carb I would say. Pretty crazy when you consider that the snack I had takes up 28.7 grams of it! What is not shown here is the total amount of calories, which ended up at 1453, with a goal defined my the MyFitnessPal app of 1560 cal, add 550 calories due to exercises, so still got 657 more, but no need to push it to the limit. According to MyFitnessPal I’ll be down to 77.9 kg in 5 weeks but that’s not going to happen. Another successful day came to the end.